high winds carried American rafts and boats into Canada. More than a thousand Americans accidentally "invaded" international borders after high winds carried their rafts and boats into Canada. The US boaters were part of the Port Huron Float Down, an annual event on the St. Clair River, which divides the US state of Michigan and Canada. Police in Sarnia, Ontario, said it took hours to transport the stranded revellers back to the US last Sunday. No arrests were made and no one was injured, according to police. The unsanctioned event - in which participants float down the river on rafts, inner tubes and other flotation devices - begins at Port Huron's Lighthouse Beach in Michigan and was supposed to end at Chrysler Beach in Marysville. But these people were not prepared for the strong winds and challenging weather conditions, which blew about 1,500 people out of American waters and over the border. 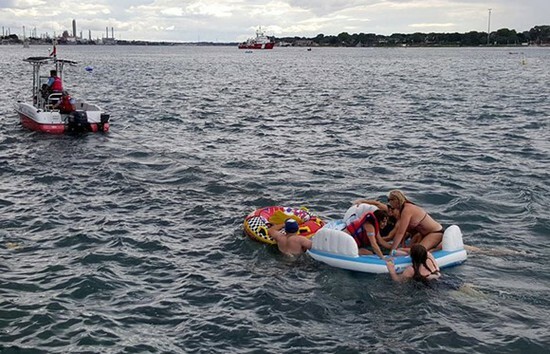 Sarnia Police Service Staff Sgt Scott Clarke told the Times Herald newspaper that participants "were unprepared to be stranded anywhere," adding that many were not equipped with life jackets. Canadian officials spent six hours and took 19 bus loads of people back to US Customs and Border Protection. Sarnia city spokeswoman Katarina Ovens said workers spent several hours cleaning up after the invasion, picking up beer cans, coolers and even picnic tables that had washed up on the shore.